She declines to name Republicans who have called Trump “nuts”. McCaskill acknowledges that the GOP has largely molded itself around Trump. She cites when the rapper Kanye West went on a profanity-laced rant in the Oval Office on live television. One argument being made to defend Trump is that his style has helped to get other parties to the negotiating table. 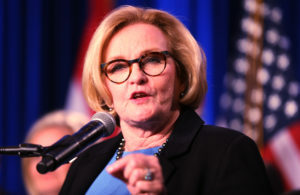 McCaskill was defeated in November’s general election by Republican Attorney General Josh Hawley. Trump heavily campaigned in support of Hawley.